Republican Gov. Rick Snyder said a right-to-work law that took effect Thursday is a milestone that will bring jobs to Michigan, while protesters promised to exact revenge at the polls for the contentious measure Snyder signed in December. 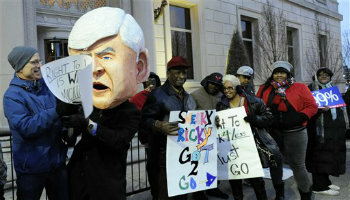 DETROIT (AP) — Republican Gov. Rick Snyder said a right-to-work law that took effect Thursday is a milestone that will bring jobs to Michigan, while protesters promised to exact revenge at the polls for the contentious measure Snyder signed in December.